One particularly successful, yet simple, initiative to turn waste into educational tools involved using old PPE, product samples from the site and things found around the site office to create Bespoke Busy Boards for toddlers. Busy Boards are designed with the ‘Montessori’ learning style in mind; kinaesthetic learning through using your hands and senses to figure out processes. Focusing on developing fine motor skills, they are hands on toys and can entertain toddlers for hours. 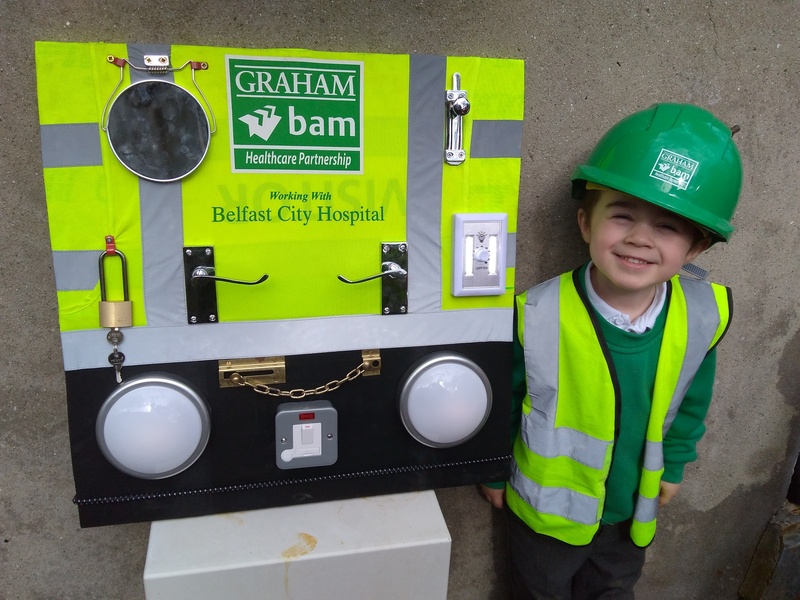 The idea of creating a Bespoke Busy Board produced from the Belfast City Hospital site came from research into how the large number of project product samples could be usefully re-purposed. 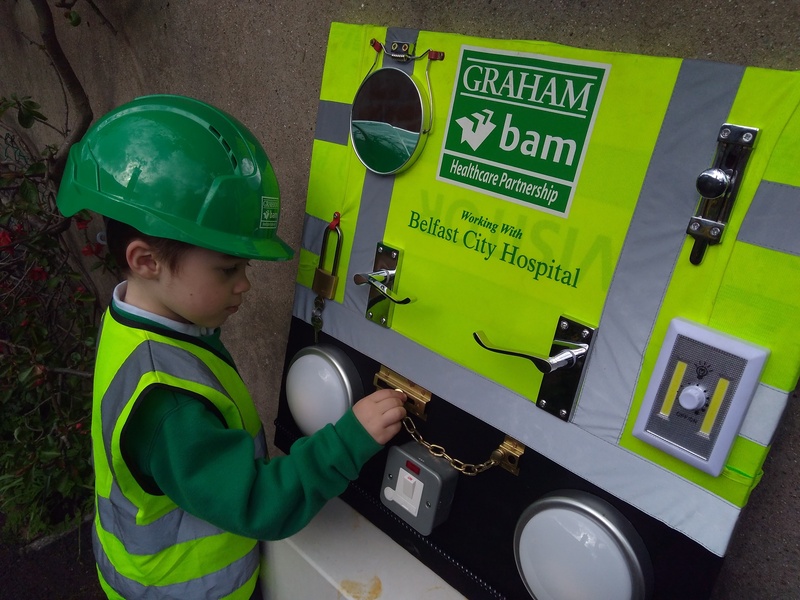 To develop the boards, Graham Bam Healthcare Partnership (GBHP) enlisted the help of several P1/ P2 children of the RAMHIF site team, who had the remit to select products and help design and test the Busy Boards they thought toddlers would enjoy. This promoted discussions between the parents and their children around construction, the role of architects and designers, and also to encourage good environmental practices. 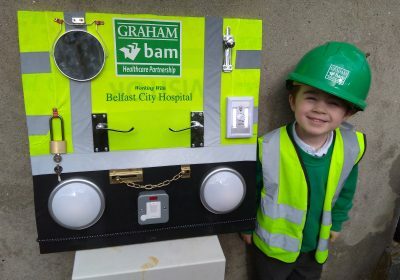 The children had great ideas about what would be both educational and fun for younger children, and came up with the suggestion of old PPE as the backdrop to reinforce the construction theme and to engage the children through bright colours. The children then designed the boards to contain different sensory experiences and challenges. These were tested out and approved by their younger siblings before being donated to the local parent and toddler groups! Feedback from both parents and children has been extremely positive, not only for the actual activities, but in encouraging construction for all genders at an early age, and also the interesting stories about the build, including about the samples considered for their local build. The boards have proven so popular that GBHP have also considered the potential of piloting Busy Boards made from construction materials to help support the educational development of children with specific sensory needs. The Belfast City Hospital site are making plans to ensure that based on these positive experiences, it should be a requirement moving forward for other GBHP sites to look into providing at least one Busy Board.